The dominant activities of the eighteenth century Wesleyan Methodist Connexion, in terms of expenditure, were the support of itinerant preaching, and the construction and maintenance of preaching houses. These were supported by a range of both regular and occasional flows of funds, primarily from members' contributions, gifts from supporters, various forms of debt finance, and profits from the Book Room. Three other areas of action also had significant financial implications for the movement: education, welfare, and missions. 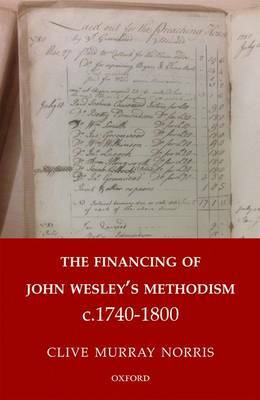 The Financing of John Wesley's Methodism c.1740-1800 describes what these activities cost, and how the money required was raised and managed. Though much of the discussion is informed by financial and other quantitative data, Clive Norris examines a myriad of human struggles, and the conflict experienced by many early Wesleyan Methodists between their desire to spread the Gospel and the limitations of their personal and collective resources. He describes the struggle between what Methodists saw as the promptings of Holy Spirit and their daily confrontation with reality, not least the financial constraints which they faced.